Hey guys it's Preston again! This will be my first year at Camp Harbor View and I can already tell that this summer will be a blast. We get a chance to fish with fishing club everyday. We have only been there for a week, but it seems like every time we see kids from the fishing club they always have a new question or fun fact about the Harbor. They come with the same energy and excitement everyday ready for a good time on the Harbor, and most importantly, they love to fish. 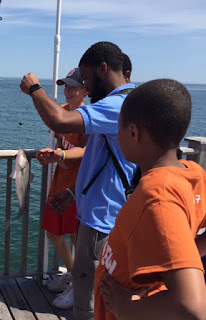 You can tell that most of the kids in fishing club are interested in not only fishing, but how fish are important to the Harbor and to us. It was only our second day at Camp Harbor View and we caught a fish! We caught a striped bass that was about 13 inches long. The kids were skeptical that we would even catch a fish that day. To their surprise we did! Although we couldn't keep the fish, the campers were thrilled to know that we actually caught a fish so close to their camp. As soon as they saw that there were actually fish in the water, they all raced to grab a fishing rod and be the next one to pull up a fish. It was only the first week and not only did I have a blast, but the kids did as well. I can't wait to see what the rest of the summer has in store for us. Until next time, keep exploring, Preston.